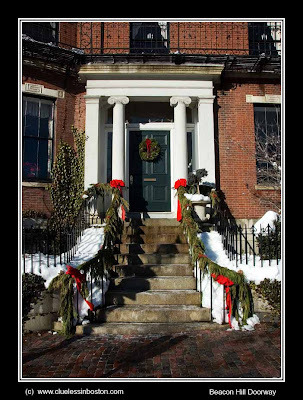 A festive looking doorway on Beacon Hill. Merry Christmas and Happy Hanukkah to all. Beautiful shot ... makes me homesick! Merry Christmas to you too. What a beautiful doorway. I wish people decorated theirs in France too. Happy Hannukah too. That's a good one -- fantastic color!